I was looking for cocktail recipes when I came across something. You know blue curaçao, that lurid blue syrup that bartenders add to drinks? Blue Lagoon, anyone? Turns out, ironically, that it is in fact a kind of orange liqueur from the island country of Curaçao (although now it is commonly sold under the same name as a non-alcoholic colouring agent). Made from a variety of native citrus peels that are dried and soaked in alcohol and spices, it is then dyed blue with artificial colouring. Which brings up the blaring question: if it has the flavour of an orange, why would you dye it blue? And with artificial colouring? Is it just me, or am I missing something here? 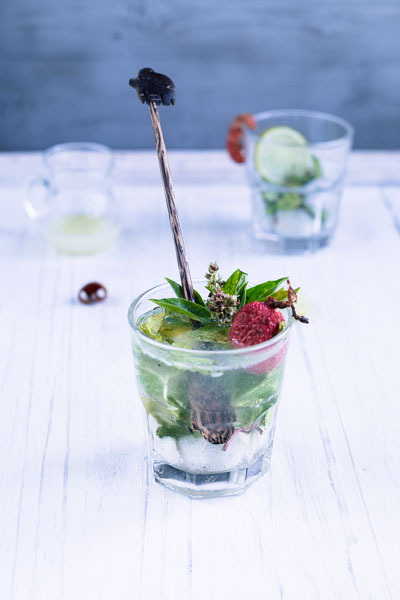 I seem to have gone off on a tangent when in fact all I wanted was to share this recipe for a mojito with you. I found some fresh lychees in the market last week and couldn’t resist buying some. You could use the tinned ones instead, or even substitute them with longans or rambutans. 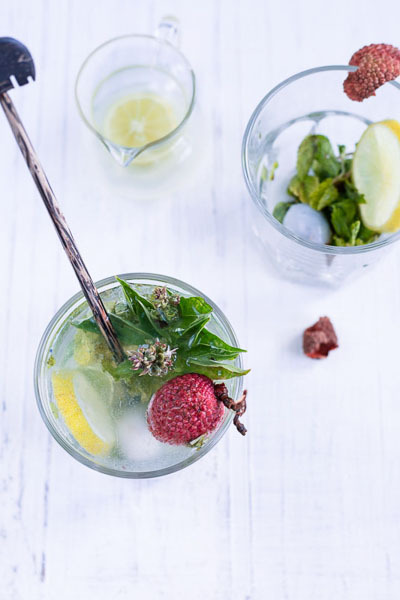 The ginger adds a little pep to the drink and works really well with the anise hit of Thai basil. If you can’t get a hold of some, mint leaves alone still work nicely. First make the ginger simple syrup: Pound the ginger into a paste in a mortar and pestle and add to a small saucepan with the sugar and ½ cup of water. Place on a medium heat and swirl the pan until the sugar dissolves completely. Remove from heat and let it sit for 10 minutes. Strain and refrigerate the syrup. Can be made up to one week in advance. 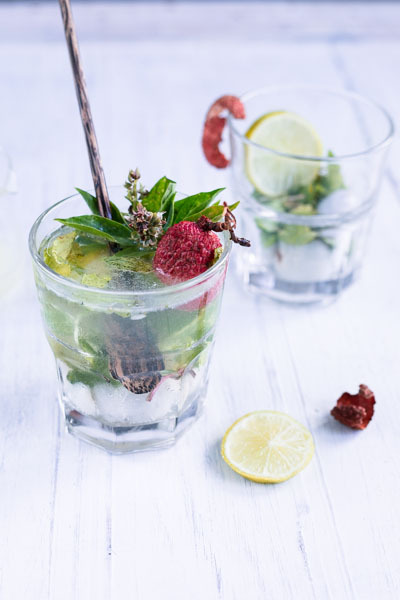 Place lychees, basil leaves, mint leaves, lemon juice and half the ginger syrup into a sturdy glass. 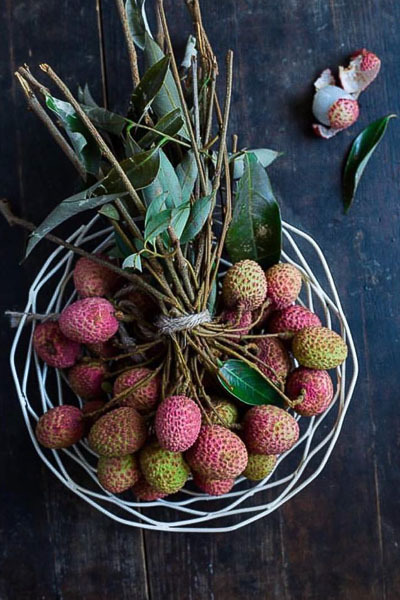 Use a muddler, pestle or rolling pin to crush the lychees and fresh herbs. Fill the glass almost to the top with ice cubes and pour over the vodka. Top with a little soda water and stir well. Garnish with a few basil leaves and lemon slices and serve immediately.